Office Assistant vacancies in Tamil Nadu Rural Development Department. Last date to submit the application from in prescribed format along with all required certificates is 30-05-2017 before 05:45 PM. Selection for this TNRD Office Assistant Jobs Recruitment 2017 will be based on personal interview only. 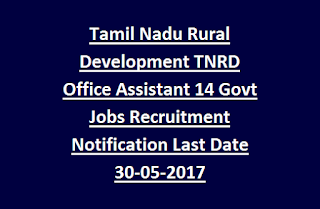 For more details regarding TNRD Office Assistant vacancies recruitment see the below given details. Last Date to reach the application form to TNRD office is 30-05-2017 by 05:45 PM. There are total 14 vacancies available in TNRD Recruitment. Candidate must have qualified 8th class and should be able to read and write Tamil language. Selection will be held based on candidates performance in interview. For General candidate age limits are 18-30 years and for BC,MBC candidates age limits are 18-32 and for SC/ST candidates 18-35 years. For Address details refer official notification. 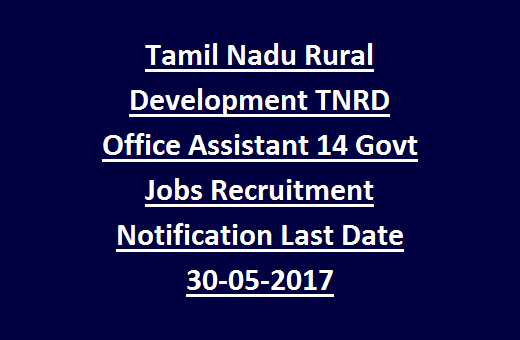 Download Application form and Notification for TNRD Office Assistant Jobs Recruitment 2017.